Remember reading that Shakespeare play in high school? The last several blogs have been pretty serious. We greatly appreciate all the responses we have gotten so far on the last post. Let's get back to our roots and have a little fun with this one - Chris and Mari style. 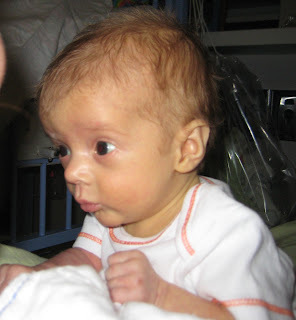 Cohen, Sophia and Finn are home now and all 3 are on heart monitors. When they sound a long beep (much like a smoke alarm) their leads have come off; these things don't stop beeping until the problem is fixed. If they make short beeps, then they have not been breathing for about 20 seconds and it will continue to beep until they are breathing again. Not funny so far, but you throw this in at 3am when you are sound asleep and it is dark, some funny stuff happens. The other night, the apnea alarm was going off so in a hurry I sprung out of bed got halfway out of the bedroom and realized I didn't have my shorts on. So I grabbed my shorts off the floor, stumbled around in the dark while I tried to pull them on but could only manage to get both legs in.....the same hole! I figured I didn't have time to fix this since one of my babies wasn't breathing and waddled into the nursery to save my baby's life. But, Tim was already there. I still had both legs in the same leg hole and hurried out of the room hoping he didn't notice. A few nights before that, the alarms had been going off like crazy. I have a tendency to not hear them when I am sleeping; or maybe I act like I'm sleeping so I don't have to get up. Well, Mari hears these things and she is the closest to the door so she usually hops up and takes care of it. After doing this several times in a row and after Tim stubbed his toe racing in there as well, Mari kinda got upset with me. She tried to make me feel guilty about her dad stubbing his toe and me not getting to the nursery before him. So the next time the alarm sounds I get up and head toward the nursery, the alarm stops on its own, I come back to bed. Mari comments that I didn't seem to be in a hurry to get to the nursery - suggesting I run a little faster next time. She asks me how the baby's color was and I told her I didn't know because I didn't have my glasses on. Mari responds, "Well, I sleep in my glasses." (I think she just decided that at the moment because I don't recall seeing her glasses on while sleeping before.) The alarm sounds again. Mari jumps up in superhero fashion and sprints through the bedroom trying to prove a point. THUD! Mari runs into the wall racing around the corner to the nursery! I'm sure it wasn't funny at the time, but now I'm dying laughing just writing this. You might imagine it is tricky trying to keep all the monitor beeps straight - you never know who is going off- especially in the car or stroller when the monitors are somewhat hidden. It has happened a couple of times now where the monitor is going off and Mari is trying to startle Sophia to wake up only to find that it was Cohen's monitor the whole time. Sophia is rudely awakened and Cohen is still beeping away! Another funny thing that seems to happen is we all start running after any beep in the house. The microwave is going off and Dawn is running to the nursery. Our old coffee machine would beep three times when it was finished brewing - it would get us every time! Our baby monitor beeps when the battery is low and we all find ourselves in the nursery looking at the monitors and laughing as we realize we were tricked again! Noah - Look How Strong He Is! Yes, sounds like you've hit the "brick wall" literally! That's what sleeplessness does to you. Thanks for the play-by-play on what happens during the wee hours of the night. That's incredible..you think they can vary the beeps so you can narrow down who it is? There's an idea! Noah looks ready to come home to be with his sibs. Look at him hold his head up! You guys are doing awesome, despite the bumps in the night! Keep it up! 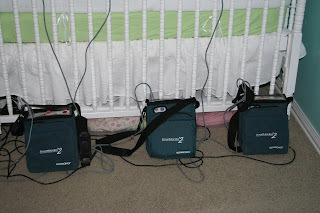 I tied a different color of ribbon on each apnea monitor to differentiate whose was whose. I would also line the monitors up in a row next to each other (in the car or when they were in the crib). When rushing into the room, I went straight for the monitors to see who was beeping, and then looked at the color ribbon to determine who that was. It helped us out a lot after several episodes like the one you described. Good luck...hang in there! The monitors are a pain, but such a blessing as well!! I was sooo happy to see three babies in the same crib when I logged on, Noah looks like he's ready to join them! Chris, I was rolling on the floor after reading the blog. See you guys soon! Oh my gosh - you guys are too funny. I love picturing the scene as it am reading it. What an absolute joy to see your beautiful babies. Sophia seems to be eyeing Finn laying there between her and Cohen. Any oh my gosh - Noah looks GREAT for all he has been through. It will be such a joy for all to see him home with his siblings. Thanks to you both for sharing your family journey with all of us. I have been waiting all day to have a break and be sure Finn made it home! And Noah certainly looks wide awake in his picture, and ready to join in the fun. What a picture your blog paints in my mind - things that go bump in the night. How precious are these gifts from God - your children and your sense of humor. I posted a note yesterday but just had to let you know how excited I am to see three in the crib together! Noah couldn't be any more cute =) My first Quad Squad visit is on the 16th, I'm praying to see all 4 of those cuties together! 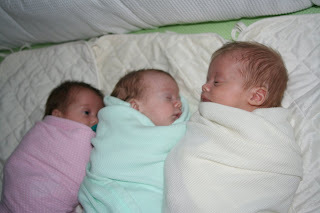 I can't wait to get there and see these babies! I think my first Quad Squad visit is on the 12th. It really looks like you are getting some good advice though, the ribbons sound like a great idea! Thank you for the good laugh, I envisioned it all. I laughed so hard at your stories that I had to wipe the tears from my eyes.. thanks so much for sharing them. It is so great to know that Finn made it home and Noah will be arriving soon. How much cuter can they can be!! Hey guys! Too funny. I guess you better sleep in you shorts Chris and put you glasses in the nursery! Thank God for the gift of laughter! Hang in there! You guys are doing and amazing job! Chris... Did you ever consider wearing a kilt? The Scot's don't have that problem! Looking forward to Quad Squad duty.